As a devoted father, you will want to maintain a close relationship with your children. Hopefully, your relationship will remain amicable with the mother of your children. Unfortunately, this is not always the case and you may find that you have to fight to see your children or alternatively, if the children live with you, then their mother may wish for contact. There are a number of types of arrangements which can work for different families. The courts can make several orders under the Children Act 1989 in order to facilitate those arrangements where necessary. The Courts are primarily concerned with the welfare of the child or children above everything else. Under section 8 of the Children Act, the Court can make a contact order. A contact order specifies how often the parent who does not live with the child should see the child or children and the terms of that contact. If you wish to apply for a contact order, the actual process differs according to your locality. You will need to make an application to either the County Court, the High Court or the Family Proceedings Court. A copy of the application is then served on the Respondent, who is commonly the other parent. You will then be required to attend a hearing. At that hearing or shortly before, both parents are usually invited to attend a relatively brief meeting with a Children and Families Court Advisory Service officer (also known as a CAFCASS Officer). A CAFCASS Officer is someone who is experienced in dealing with conflicts regarding children. At this meeting, the Officer listens to both parties and sees if there are any areas of agreement. During the first hearing, the Judge (usually a District Judge) will ask the CAFCASS Officer for advice (if they are present) and will identify the areas of agreement and also any areas in dispute such as visitation rights etc. This hearing is usually short in length and in most instances the parents may not even speak with the Judge. Where no agreement is reached, the Judge may ask for a detailed report to be drafted by the CAFCASS Officer. This can take anything from three to four months and therefore, you may wish to request that the Court grants some contact in the interim period. What Will the Report Detail? The CAFCASS Officer will interview and possibly observe a number of things before reporting back to the Court. They will want to speak with both parents, possibly the school and may want to speak with family members. They may also wish to observe contact between parent and child in some cases. Depending on the age of the child, an Officer will speak to them alone to understand their wishes and feelings. The report is not “secret” and both parents get to see a copy before it goes in front of the Judge. After this stage, there will be a further short hearing. A court will not always make an order. Most cases end at this point once both parents have reviewed the recommendations of the CAFCASS Officer and they decide to try the recommended contact arrangements. The child's emotional, physical and educational needs. Only if a parent does not agree to the recommendations, will a final hearing take place. In these circumstances, the Court hears evidence from the parents and any witnesses as necessary, before finally making a Contact Order. It is important to remember that although this process may seem rather arduous and lengthy, the end result will be worth it. The most important consideration for the Court is what is best for the child. 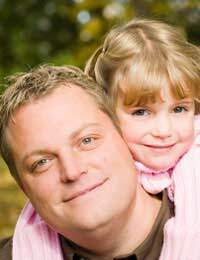 If you are a good father and want the best for your child or children, then you will be able to have contact with them in the end. Good luck and if you are fortunate enough to get the contact you need, check out our feature on coping between contact periods. I live in Devon and my ex has moved to Bournemouth with DS. There is no court order placed but she's only allowing me to see him through a contact centre there. She has agreed to mediation but I fear both of these processes will take up a fair amount of time to get settled. Can I take DS from the centre if I wish? I can only see that if there is a referral (from court) or, if it is a written agreement between both parents... Is the written agreement based on court proceedings or the rules of the contact centre? Would she be given the option to refuse this to happen. I'm not in a position to go to court for joint custody and feel the only real way I'm going to get to raise my child is to bring him home with me. I don't want to cause more trouble but I miss him so much. Hey daughter you just need to channel my spirit and my love for you remember to always stay in school and make something off your life darling .your mother is no good a grub ugly on top off it . (Goodbye bye beautiful daughter I love you more then anything bree you are the apple off my eye to we meetagain .god bless angel I know you be right you have half my blood Andspirit witch can’t be beat that’s gods truth . After years off research into trying to see my daughter (orders on me )false allegations all my (ex affairs) its the (end the line now) .f the lot off them now .i tried my slate is clean yeah and I am the better person .if they don’t have the balls or decency to talk to me well f them .dont play your (pathetic girly games with me women because women like you are dime a dozen and so easy to get ).and in reality my ex has all the worry off teenagers and the expenses .i walked free not worry in the world .and after all the guys in my family come out and told me truth why in the hell would I want anything to do with her or her child?.plus the time frame ?.so yeah it is the final end. After research about c 100 and mediation and with the (time frame) yeah I won’t be going down that path .i honestly think that (her daughter be messed up )just like her mother purple haired freak that women is nearly 50 and she poses in photo like teenager she reminded me when I was child and all the old women had permed purple hair with there custom made trolleys for shopping .i even heard she turned into mrs puss the cat lady .oh dear I did dodge a bullet and never paid a cent sweet luck off the Irish .go see Gordy he is old he loves purple perms on women and be more then willing to provide for her offspring. @jay.i was going to get a solicitor to see my daughter but won’t be now .it (hurt )not two (I loved my daughter) .there is a mutualunderstanding between my mother off my child and myself (keep well away from me freak )because I don’t like her one bit she has (absolutely nothing to offer)thats why she left to be with (her kind) thank god that was the best day off my life I think she ended up hooked on drugs .we got to the stage now finally with the guys in our family that will( laugh at her )and say man that women had some (serous issues )ha ha .i am just glad it’s my past and 8 see my daughter again it’s not the end off the world . My ex keeps saying, either agree to what arrangements she's suggesting, or take it to court. I used to see my daughter after work for a few hours on a Monday and Wednesday, then overnight friday, I was 15 minutes late dropping litlen off one Wednesday, and ex says "that's it, no contact, take it to court" Not really thinking of litlen... Anyway, exes mother got involved, and it was arranged that I pick litlen up after work on a Friday from hers, and drop her off there on the Saturday too. So it's gone from seeing litlen 4 times a week and one overnight stay...to just one overnight stay, and me doing all the picking up and dropping off. The ex is now suggesting that I have litlen every other weekend, which in my eyes, isn't in the best interest of my child, as litlen used to seeing me minimum on a weekly basis... I'll add that the ex will not allow any midweek phonecalls between me and my child, unless I buy a 5 year old a mobile phone, which will only be turn on when the mother wants it on. The system is a joke, as I don't think I can afford even the application fee for court, so she will still be in control of all situations, which I thinks unfair on my child. Hi, I was wondering about the whole contact with father, I have just got out of a 5 year physical and mental abusive relationship in which my children’s father raped me, beat me up and almost killed me. I ended this relationship in July on that day he strangled me and hit my youngest child which resulted in him getting a black eye, he has abused all my children constantly over the years and now we are awaiting to go to court in October. I want to stop him getting contact as he trying to obtain full custody of the children, he has never done anything for them, or even been a father to them I have done it on my own from the start, I’ve been in touch with a solicitor to get some sort of contact or residence order, but I want him rights taken away as he is an unfit father and he is abusive to my children I do not want him to be part of my children’s life or mine either. Now when we go to court if he is found guilty (he pleaded not guilty, but said he was guilty in his police statement the day it happened) if he is found guilty he will most likely serve time for this but if he gets off with it then he will try to take the children from me and obtain full custody I have witnesses and evidence of the way he was with my children and I will make sure he doesn’t get contact with them, I just want to know if I will be successful in this because my children are much better off without him they have just started school and my youngest will be starting nursery soon they are doing brilliantly and I don’t want him to start having contact with them and mess it all up. Can I have some advice as to what else I can do to stop him having contact? My wife sent a non molestation order against me and kept away my girls for 9 months, 6 and 3. I’m disabled and had never lifted a finger against her but at the court hearing when the judge asked about contact; it was decided, every 2 weeks for the day. It’s been 2 months and my girls have been staying with me over night, travelling to family, etc. My wife now wants me back, and I said no. She has now stopped sending the kids. What can I do? The standard access generally awarded by the courts is every other weekend overnight and one night in the week (not overnight). However, it is unlikely a court will force your ex to take your child if and where he is unwilling. As in all cases, the court’s main concern is the welfare of the child in question. The court will always put the child’s best interests first and this main issue will determine the outcome of any application for an order. I have a 14 month old daughter and have been refused access for the last 4 months I've never had full access since birth now I've been cut off completely and she's threatening court to remove parental rights, changing her name and getting a passport ect so far anything she's lied about she's got away with so I'm assuming the same will happen in court when it finally gets to it. What do I do? My 13 year old daughter who I had regular agreed access to has now decided she no longer wishes to stay with me and my wife. She would make excuses to not come down, now she is flat out refusing saying a lot of hurtful things to us. Her mum and stepdad claim to have encouraged her to come down and that sorting access is between myself and my daughter, but knowing them as I do, I know they will be manipulating her and discouraging her from staying over.Can a child of 13 make the choice not to visit her dad, who up til last year had very frequent visitation with his child? I fear my daughter is being used as a pawn in a game, however I fully understand that at her age her hormones and emotions must be all over the place.Any advice is greatly appreciated. I am sorry to hear this. This is a tricky situation and one that should be sorted out through communication and to try to find out what the issues are. You could force the issue and apply to court (if your child's other parent won't agree to mediation). However, pushing the issue is the last resort and you should perhaps try to sort the matter out outside of court in this instance. A court will listen to the reasons your child gives. However, as in all cases, the court’s main concern is the welfare of the child in question. The court will always put the child’s best interests first and this main issue will determine the outcome of any application for an order. My 13 year old daughter who I had regular agreed access to has now decided she no longer wishes to stay with me and my wife. She would make excuses to not come down, now she is flat out refusing saying a lot of hurtful things to us. Her mum and stepdad claim to have encouraged her to come down and that sorting access is between myself and my daughter, but knowing them as I do, I know they will be manipulating her and discouraging her from staying over. Can a child of 13 make the choice not to visit her dad, who up til last year had very frequent visitation with his child? I fear my daughter is being used as a pawn in a game, however I fully understand that at her age her hormones and emotions must be all over the place. Any advice is greatly appreciated. You are doing the right thing. Unless your son's ex can prove that he should not be in his daughter's life then in all likelihood access will be granted. Shared-care will only be granted if prior to the relationship breaking down only if your son had shared-care then. You can see more regarding the Scottish process via the link here.